Fresh, succulent shrimp enhances the flavor for various recipes. These tips will help you cook up amazing shrimp dishes. Choose firm, juicy shrimp that have translucent moist shells, with no black spots (unless you’re buying tiger shrimp). The shrimp should have a fresh and sea-like scent. Any strong odor suggests the shrimp aren’t fresh. Yellowish shells or dry spots indicate freezer burn. Smaller cold-water species of shrimp are sweeter and more succulent making them an excellent choice for sandwiches and salads. Larger shrimp are very tasty and adapt well to spicy dishes which is why they are regularly used in oriental cooking. Cut a small slit down the back of the body of larger shrimp with a sharp knife, exposing a black vein. Remove the vein using the tip of the knife. The vein is edible, but can taste a bit gritty, particularly on larger shrimp. Wash the shrimp before cooking. If you’re butterflying the shrimp (splitting and flattening it), you should shell it, but leave the tail in place. This will give you something to hold onto later. Remove the vein as mentioned above, but take extra care not to slice the shrimp all the way through. Take the knife and work deeper into the shrimp. Push the meat apart and you’re left with a butterfly shrimp. Shrimp generally cooks within a matter of minutes. Medium-sized shrimp usually take 3-4 minutes to cook, large shrimp 5-8 minutes and extra large shrimp take around 7-8 minutes. The shrimp are cooked when their flesh has turned pink and opaque throughout. 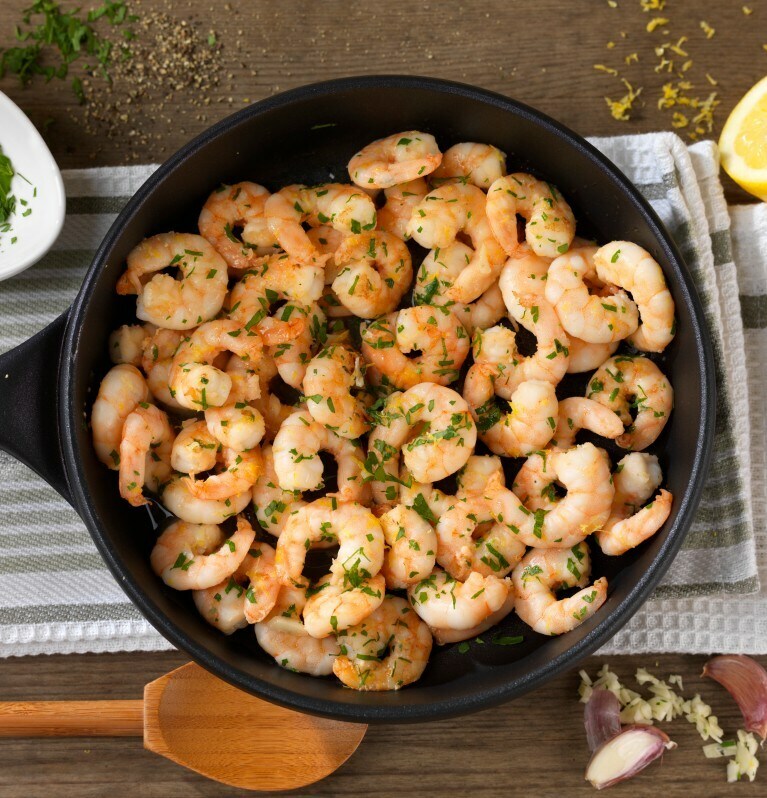 Melt some Country Crock® Spread in a large skillet, add the shrimp, some minced garlic and cook on high heat. Cut one of the larger shrimp in half to check it is cooked through before serving. If cooking large amounts of shrimp, use two frying pans to ensure the temperature of the pan remains high when the shrimp hits the spread.